I wrote about Court Presentations nearly five years ago, and back then there were plenty of pictures and illustrations of women in their court dress, but it was difficult to find any of men in their court dress. Fast-foward to today and more libraries are adding to the digital archive. Coat.—Black Silk Velvet, stand collar, single-breasted. The fronts are cut small and cannot be buttoned: to be worn open. Plain gauntlet cuffs. Pocket flaps, with three points on the waist seam. Six buttons are placed on the Right forepart, and a similar number of notched holes on the Left. Two buttons at the waist behind, and two at the bottom of the back skirts. Pockets in the breast and in the tails. Body of the coat should be lined with White Silk and the skirts with Black. Waistcoat.-—White Satin or Black Silk Velvet (not White Corded silk or White Marcella). No collar. Four buttons of small size, to match the coat. 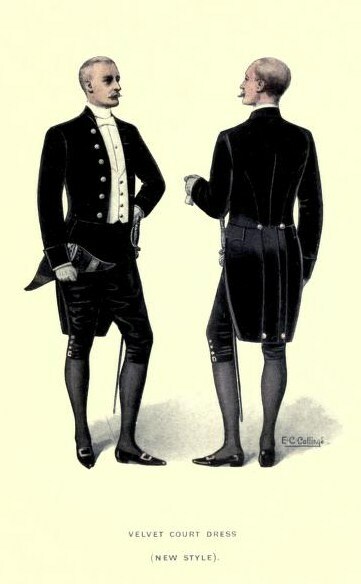 Breeches.—Black Silk Velvet, with three small steel buttons, and steel buckles at the knees. Shoes.—Black Patent Leather, with steel buckles. Hat.—Black Beaver or Silk Cocked Hat, with a steel loop on a black silk cockade or rosette. Sword.—Steel hilt, with black scabbard and steel mountings. Sword Belt.—Black Silk Web Waistbelt worn under the waistcoat, with Black Velvet frog for the Sword. 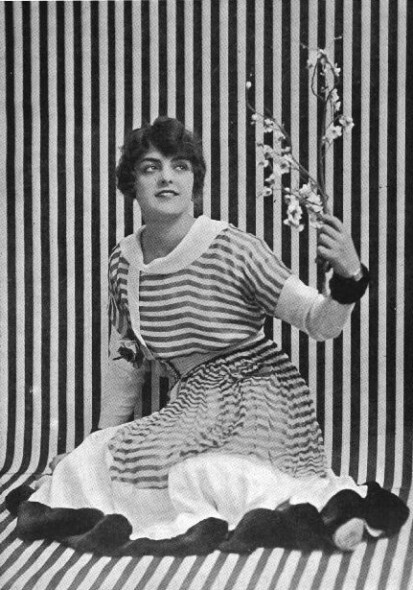 White Bow Necktie and White Gloves. 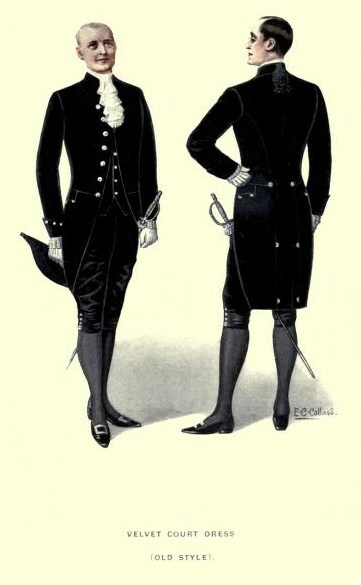 At Levees.—Trousers of Black Silk Velvet may be worn with this Style of Court Dress. Plain Military Patent Leather Boots should be worn. Coat.—Black Silk Velvet, stand collar, single-breasted. Seven buttons on Right front and seven notched holes on the Left. The fronts meet edge to edge at a point on the breast, where they are secured with a hook and eye. Plain round gauntlet cuffs, with three notched holes and buttons. Pointed flaps on waist seam, with three buttons, one under each point. Six buttons behind, that is, two at the waist, two at centre of skirts, and two at the bottom of the back skirts. Body of the coat should be lined with White Silk and the skirts with Black. Pockets in the breast and in the tails. Black Silk “wig-bag” Or “Flash” is attached to the coat at the back of the neck, hanging over the collar. Waistcoat.—White Satin or Black Silk Velvet (not White Corded Silk or White Marcella). No collar. Four buttons. Skirted fronts, pointed flaps to the pockets, with three buttons under each flap. Sword.—Sling Sword, with steel hilt and black scabbard with steel mountings. Sword Belt.—Black Silk Web Waistbelt with slings. One thing I anticipate about Downton Abbey’s third series? The lovely 1920s lingerie. Corsets haven’t been entirely banished, but gone are the layers of Edwardian undergarments and in with the step-in, or envelope chemise, the brassiere and bralette, tap pants, knickers, teddies, and camisoles. 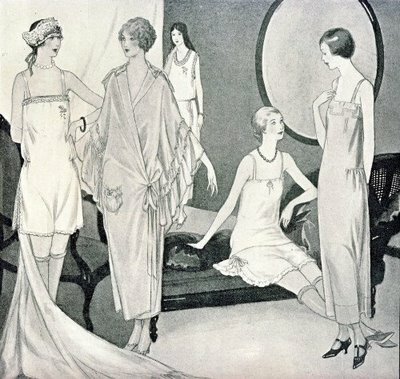 In response, I’ve put together an Etsy treasury of 1920s lingerie that will inspire and delight!